I enjoy DC's annual Cherry Blossom Festival, hitting the Tidal Basin every year to rent a paddle boat and soak in our region's most obvious sign of spring. Saturday: Join the Potomac River Watershed Cleanup! Saturday, March 31, 9:00 a.m. to noon. Join ACE, the Alice Ferguson Foundation, and the Potomac Conservancy for a Potomac River cleanup project. The meeting location is on the Virginia side of Chain Bridge, under the GW Parkway in the small parking lot at the intersection of Glebe Road and Chain Bridge Road. For directions and tips, see our Streamtips page. Register for the cleanup at 703-228-6406 or email us! What Are the Conditions at Chain Bridge? The terrain along the Potomac is a little rugged, so you should be prepared to hop on rocks and cross streams if you want to get down to the river. There are some less demanding spots too, so that shouldn't prevent anyone from coming. What Are the Directions to Chain Bridge? Chain Bridge is at the feet of Glebe Rd and Chain Bridge Rd. If you are going north on Glebe, as you descend into the Potomac valley, just as the road takes a sharp right turn toward the bridge, there is a parking lot on the left under the GW Parkway. That's our rendezvous. If you're coming from 495, Fairfax, etc. on Chain Bridge Rd, the road ends at a light. Turn right (instead of left onto the bridge) and the rendezvous is right in front of you. If you are familiar with the area, park above the area on Randolph Street and walk down the bike path. The area is accessible by bike from Military Road, crossing the overpass over Glebe Road, and proceeding down Randolph one block to the trail down into the valley. Not exactly a bright morning to be a Virginia environmentalist. While the newspapers are raving about Maryland's bold environmental leadership, Virginia Governor Tim Kaine signed a power bill he should've vetoed. Gov. Kaine made only minor changes to gently urge Dominion towards providing renewable energy. The bottom line is that this proposal is purely to increase Dominion's profits while demonstrating complete disregard for Dominion customers, Virginia residents and the environment. Contrary to the multi-million dollar media campaign they have undertaken to scare people into believing we need these lines, they refuse to provide any proof. As you know, many here at Raising Kaine - as well as groups such as the Virginia Conservation Network, Piedmont Environmental Council, the Northern Virginia Regional Commission, AARP Virginia, etc. - had been urging Gov. Kaine to veto or heavily amend the bill. ... Those appear to be positive changes, but I'll have to study this more closely before I decide whether it takes the bill from the "absolutely awful" category to "acceptable." I just learned the details of a major climate change rally coming up next month in Rosslyn. It's called "Step It Up," and it's critical you come out and show Congress it must act now to minimize the coming crisis. Arlington County Board Chair Paul Ferguson and NBC4's Wendy Rieger, two of our region's leading environmental voices, will address the rally. The Green Miles has also been invited to speak. You can get more details of the local rally on the Sierra Club DC's website, and more details of the national effort at the Step It Up site. Mark your calendar! On Saturday, April 14, at 1:00 p.m., join the groundswell of support for addressing global warming and energy challenges at the “Creating a Climate of Change” Rally at Gateway Park in Arlington, VA. This rally is inspired by Step It Up 2007 ( www.stepitup2007.org ) and will be one of hundreds of rallies across the country that day. The Mt. Vernon Group of the Sierra Club and Arlingtonians for a Clean Environment are sponsors of this event. Gateway Park offers a powerfully symbolic setting for this global warming rally. The park overlooks the tidal (sea-level) Potomac River and also Theodore Roosevelt Island, evoking the timeless conservation message of our Nation’s 26th president. Come for the historic experience. Come for the great speakers. Come lend your support for new societal change. Confirmed speakers include: Arlington County Board Chairman, Paul Ferguson, who has made global warming his 2007 theme; Scott Sklar, President of The Stella Group, Ltd.; NBC 4 News Anchor, Wendy Rieger, and Martin Ogle, event organizer and long-time advocate for energy efficiency and conservation. Other speakers will be added. Rally participants are encouraged to take Metro. Gateway Park is less than ½ mile from the Rosslyn Metro Station on the Orange Line. 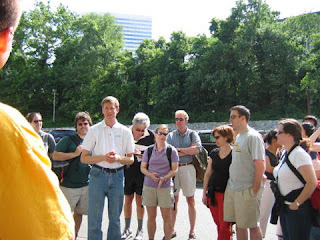 It is located on Lee Highway just before it ends on the ramp for Theodore Roosevelt Island, and is accessible from the Custis Bike Trail. Participants are encouraged to take Metro or ride bicycles. Those who must drive can find public street parking and also spaces in the parking lot for Rosslyn Spectrum Theater accessible from Arlington Ridge Road, one block east of Kent Street. For more information, contact Chris Carney. William D. Lecos, president of the Fairfax County Chamber of Commerce, said if the amendment prohibits cigar smoking in the bar area of power lunch places such as the Capital Grille in Tysons Corner, the impact might be to "destroy commerce as we know it." Just like Tyler said ... we'll be stalking elk through the damp canyon forests around the ruins of Tysons Corner. You'll climb the wrist-thick kudzu vines that wrap the Washington Monument. And when you look down, you'll see tiny figures pounding corn, laying strips of venison on the empty car pool lane of I395. All in the bizarre alternate reality of William D. Lecos. Congratulations to Governor Tim Kaine for showing great leadership pushing to make Virginia's bars and restaurants smoke-free! He amended a bill yesterday to include a bar and restaurant smoking ban. Similar legislation has passed the Senate repeatedly in the last two years, but the House has refused to even allow the bill to come up for a vote before the full body. The rest of the House has been able to hide behind a tiny committee that's blocked the bill, but as I've written before, now they'll have to step out of the shadows to vote. And really, that's all we've been asking for -- the full House and the full Senate take votes, and if they pass it, the Governor decides whether to sign it. A little bit of democracy in Richmond. Was that so hard? At the end of 2006, New York Times columnist Thomas L. Friedman wrote: “We reached a tipping point this year – where living, acting, designing, investing and manufacturing green came to be understood by a critical mass of citizens, entrepreneurs and officials as the most patriotic, capitalistic, geopolitical, healthy and competitive thing they could do. Hence my own motto: ‘Green is the new red, white and blue.’” We hope the green momentum continues throughout 2007, the15th year of the Environmental Film Festival, and well beyond. From its inception in 1993 with a small planning grant, the Festival has evolved as a collaborative effort presenting a wide variety of quality films all around the nation’s capital. And why wait for the Nationals' season to start when you can catch a live baseball game right here in Arlington this weekend? The George Washington Colonials' season is well underway, and they're hosting Fordham this weekend in a three-game homestand. You can see the full schedule here. The Colonials play at Barcroft Park on Four Mile Run Drive in South Arlington. Q: Is global warming real? And is it man-made? A: Global climate change is a serious challenge, and we are performing the basic applied research that will confront it. Q: But does a preponderance of evidence show that it is man-made? A: My understanding is that the IPCC (Intergovernmental Panel on Climate Change), of which we are a part, believes that at least part of the increase in temperature is man-made. Q: Have you seen "An Inconvenient Truth"? A: No, I haven't. I really can't comment; it would be unfair. "At least part of the increase"? The IPCC has reported there's "at least 90 percent certainty that human activities, led by burning fossil fuels, [are] stoking warming." Also, I get a chuckle out of the utter refusal of conservatives in general and Bush administration officials in particular to admit even having seen the movie. Just because you learn about other perspectives doesn't mean you disagree with them; it's called "opposition research." I certainly don't agree with the columns of Bob Novak, George Will, and Charles Krauthammer in the Post, but I read them to understand the conservative point of view. Y'know, An Inconvenient Truth is out on DVD, maybe we should all chip in and get him a copy? Tell you what, if anyone donates at least $20 to ACE today through the NetworkForGood.org charity badge on the right side of this blog, I'll send Mr. Orbach a copy of the DVD and some microwave popcorn with a little note that says "From all of us here at The Green Miles." Any takers? Tonight: CRM's Beers with the Bloggers! CRM's Beers with the Bloggers takes place tonight! We'll be at Carpool from 7pm until around 9pm in the front room (facing Fairfax Drive). Just look for me in the tshirt with the ornate multi-hued CRM logo. However, if you would be more swayed by an event pitch written entirely in Office Space and Chappelle's Show references, click here. Every year, Americans drink more than 100 billion cups of coffee. Of those, 14.4 billion are served in disposable paper cups— enough to wrap the earth 55 times if placed end-to-end! Those paper cups contain a plastic lining made from a petrochemical that would produce enough energy to heat 8,300 homes. That’s a town the size of Newtown, Connecticut. I'm willing to bet that if they were called petrochemical cups instead of paper cups, a lot more people would bring their own travel mugs. I've always had a travel mug or two in the cabinet, but I usually only break them out when I'm bringing a big cup of coffee at the start of a long drive. Part of the reason this hasn't registered with me until now is that I rarely buy brewed coffee. I have a coffee-maker at work, and I'm religious about making it there, bringing in cream and sugar, etc. Not to get all coffeenerdness, but I've always preferred a strong cup of drip coffee to a cappuccino/latte/whatever anyway, and when the lattes are $4 compared with $10 for an entire pound of coffee beans, it's an easy choice. But I watch co-workers go out for coffee several times a day, coming back with a new, white, bleached paper cup every time. Is coffee really that hard to wash off of a cup? There's even a dishwasher in the office! Keep a couple of travel mugs handy and you'll never have to lift a sponge! OK, I suppose ranting won't win any converts, but here's something that might. 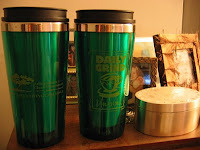 The Daily Grind location at N. Quincy and N. Fairfax in Ballston is offering special Green Living Challenge travel mugs. At $10, they're cheaper than Starbucks travel mugs, and Daily Grind will give you refills for just $1. Get it refilled every day for two weeks and you've made your money back. So now I have the tools (shiny new travel mug), the motivation (of completing the challenge), and the desire (Daily Grind makes a nice strong Guatemalan) to complete another step of the challenge! You can track my progress here. You've heard the environmental mantra, "Reduce, Reuse, Recycle." It's easy to skip the first two and go straight to the last one. After all, they're almost in decreasing order of difficulty -- while reducing and reusing ask you to change your behavior, recycling merely involves adding a little effort to the end of your existing habits. That's not to say recycling isn't important -- it is. But by reducing and reusing, there's no end product whatsoever -- you eliminate even the need to recycle. No materials used to create new product, no big, gas-guzzling trucks needed to haul the recycling away. A couple of weeks ago I was helping a friend move when she ran out of boxes. Most of the big stuff was already in the truck and there were plenty of people to help with the little stuff, so I offered to make a box run. She gave me $20 and told me to go to The Container Store in Clarendon to buy some boxes. I was almost offended. Buy boxes? Are they that valuable and rare of a commodity? A flashback may help explain. Growing up, my dad worked in a printing shop. Before any move, he'd spend weeks assiduously bringing empty paper boxes home, a couple at a time since he took the T home. In the Grant household, boxes flowed like hot and cold running water. So when she told me to buy boxes, I knew exactly where to go -- the liquor store. Sure, I may have needed to restock my liquor cabinet, but I also knew they'd be happy to get rid of some of their old boxes. An easy chance to reuse. I take the same approach with grocery store bags. I get paper bags, which get a first reuse as a fort for my cat. They get a second reuse as container for my recycling, which I have to walk over to the local Arlington County recycling center since my apartment complex, Ballston Park, offers bare minimum recycling facilities. Then they get recycled at the facility. Of course, I could eliminate the need for the paper bags altogether by bumping up my degree of difficulty from reusing to reducing with a reusable grocery bag. I've now acquired a reusable grocery bag and am keeping it in the same cabinet where I keep my coupons, and I'm hoping to get in the habit soon. Although considering I already walk to the grocery store to buy mostly organic products, if I add a reusable grocery bag, my bleeding heart may explode like I was a tree-hugging John Henry. "Living Green in Arlington" a Huge Success! I've posted a review of "Living Green" over at What's Up Arlington! Not only did we get nearly 200 people to come out on a cold, wet, windy night to hear about local environmental issues, we raised about $1,000 for conservation programs right here in Arlington. The discussion is already going in the comments section, so please join in! PS -- Thanks to The Green Girlfriend for taking all the great pictures! See you tonight at Living Green in Arlington! I'm looking forward to seeing some familiar faces and meeting some new ones tonight at the annual meeting for Arlingtonians for a Clean Environment, "Living Green in Arlington: Renewable Energy, Clean Water, and Buying Responsibly"! The free event takes place tonight from 6:30 to 9:30pm at the NRECA Building (4301 Wilson Blvd., across the street from Ballston Mall and two blocks from Ballston Metro). ACE board members, staffers, and interns have done a phenomenal job putting the event together. We have an amazing total of 22 businesses and groups scheduled to have representatives and information at the event, a testament to both the excitement surrounding the event and the hard work that's gone into planning it. It'll be worth the trip just to hear County Board Chairman Paul Ferguson and NBC4 anchor Wendy Rieger. They're two of our region's best environmental advocates, and it's going to be quite a double feature to be able to hear them both speak on the same night. We'll also have a special offer for people who become ACE members tonight, along with information about ACE's Green Living Challenge. I just posted a OneBrick volunteer's review of Saturday's cleanup over at What's Up Arlington! Note The Green Miles in the back row of the first photo with the blue Patriots cap. And of course, stylish layered sweatshirts. Arlingtonians for a Clean Environment Executive Director Elenor Hodges has a guest post up at Arlington's Fresh AIRE blog. Check it out & leave a comment! The clock is ticking on climate change. Leading scientists are warning we are near "a tipping point" and must act now to avoid large-scale, irreversible impacts. We get the message. But does the new Congress? Be a part of the Climate Crisis Action Day in Washington D.C. on March 20, 2007, and tell our leaders we can't wait any longer . Visit www.ClimateCrisisAction.org to sign up today - or to find out other ways to take action right now even if you can't make it to DC. Thousands of concerned citizens will gather at the United States Capitol to tell Congress it's time to tackle global warming head-on, with responsible energy decisions and protections - not drilling - for special places like the Arctic Wildlife Refuge. Come listen to politicians, celebrities, religious leaders, and activists from across the country. Then, we'll give you a chance to go speak with your legislators personally, to make sure reversing climate change is at the top of their "to-do" list. Global warming is already under way. Hurricanes, floods, and drought are becoming more frequent and intense. As the Arctic ice shelf continues to melt away, polar bears are drowning in their search for food. And all the while, drilling for oil continues to ravage our remaining wild lands. Let's call on the new Congress to curb global warming by moving toward a smarter, cleaner energy future. We can't afford to let the clock tick any longer. let you know if he finds anything. More good news. The managers from the car wash & Jiffy Lube agreed to clean up the trash behind their businesses along the stream banks where our volunteers could not reach. There is a significant amount of trash back there. We’ll try to keep better track of that area. I will try to check it out, although it does sound like the iron oxidizing bacteria that we see occasionally in the County streams. I was able to click on the pictures and see them up close. The iron is dissolved in the groundwater, and it oxidizes as it enters the stream along the edge of the stream. You can see that in the picture. Although there is also a large puddle of up on the bank too. The “oily” sheen is from the bacteria that oxidize the iron. They look very much like oil, but one way to differentiate them from an oil slick is to stir them up with a stick. The bacteria will break up into clumps, and oil would just swirl around on the surface of the water. I will check with the Fire Dept. and will stop by and check it out as well. I’ll let you know what I find out! Filmy deposits on the surface or banks of a stream are often associated with greasy "rainbow" appearance of iron bacteria. This is a naturally occuring phenomenon where there is iron in the groundwater. However, a sudden or unusual occurrence may indicate a petroleum product release from an underground fuel storage tank. One way to differentiate iron-oxidizing bacteria from oil releases is to trail a small stick or leaf through the film. If the film breaks up into small islands or clusters, it is most likely bacteria. If the film swirls together, it is most likely a petroleum discharge. We had a great time at Saturday's Four Mile Run cleanup, with a chilly morning turning into a beautiful spring-like day. We'll have a review of the cleanup posted to What's Up Arlington shortly, but first I wanted to spread the word on some startling discoveries made by the volunteers. The cleanup took place along Four Mile Run behind Barcroft Park, with volunteers fanning out down the stream banks past several businesses. 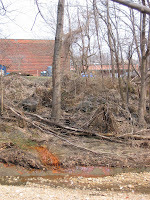 Behind the Jiffy Lube at 4148 S. Four Mile Run Drive, volunteers noticed discolorations on the stream bank -- part of it orange, part of it oily. In the attached photo, you can see the orange discoloration with the oily sheen to the right. Park officials plan to have the Arlington County Fire Department investigate the discolorations on Monday, and I'll report their findings as soon as I hear them. ACE Executive Director Elenor Hodges tells me it's possible that what we saw is an orange algae that grows along parts of the stream (although that wouldn't explain the oily spot). 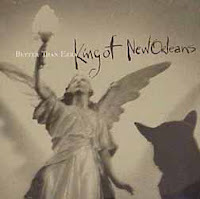 Anyone recognize if this is it? Another volunteer found an entire transmission embedded in the stream itself. Park rangers advised him to leave it in place, fearing an attempt to remove it could release the transmission's contents into the stream. You can see the transmission in the lower left of this photo. A longtime ACE volunteer told me it's not the first time car parts have been found in the stream below the Jiffy Lube, but it's hard to say where they came from since car parts are commonly found all over that stretch of stream. Volunteers reported filling three large trash bags with oily towels and light blue rubber gloves -- the same color gloves worn by the Jiffy Lube workers. I don't have a photo of the scene (I wish the volunteers had given me a heads up about the towels and gloves before they'd picked them all up), but I walked behind the Jiffy Lube and saw several light blue gloves and towels on the Jiffy Lube property that abuts the stream bank, along with dozens of bottles and old coffee cups. I talked briefly with the Jiffy Lube manager, but on a busy Saturday morning with a long line of customers, he seemed too frazzled to get into a long discussion. 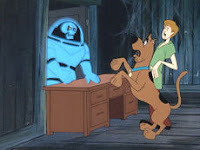 I told him what we'd found and gave him a heads up the county would be coming by to investigate. Dominion Re-Regulation & Smoke-Free VA: Contact Gov. Kaine Now! * The American Cancer Society urges you to write Gov. Tim Kaine to tell him to modify HB2422 to include a smoking ban. I've written before on my support for this strategy. You can email the governor through their action alert. 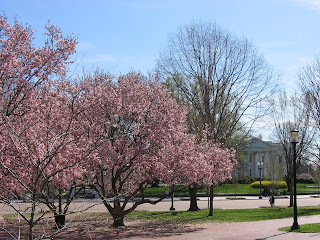 On behalf of Arlingtonians for a Clean Environment, a community nonprofit with hundreds of volunteers working to create a more sustainable Arlington, I am writing today concerning electric utility re-regulation. We ask you to oppose SB1416 and HB3068. Any utility restructuring plan should safeguard consumers and advance Virginia toward a sustainable energy future. We oppose higher rates to pay for new power plants that will only make the air dirtier, increase the effects of global warming, and cost consumers billions over the next decade. Instead, utilities should be required to invest in renewable energy, energy efficiency and conservation programs. Programs such as a systems benefit fund, net metering, and peak-demand management, will lower electric bills while protecting public health, the environment and our economy. We should invest in renewable energy sources that will lower our long-term energy price tag by reducing the impact of global warming. Already, our federal leaders have recognized that something must be done to reduce our greenhouse gas emissions, and Fortune 500 companies like GE, DuPont, Alcoa and Duke Energy have endorsed national carbon caps. There are also major questions to be answered about whether the General Assembly has drafted this legislation in the best interests of Virginians or in the best interests of one of the Commonwealth’s top political donors. The Virginia Public Access Project reports Dominion has made nearly $3.8 million in campaign donations the past 10 years. Eleven legislators own at least $10,000 in Dominion stock, and Sen. Benjamin Lambert is a member of Dominion's board of directors and owns more than $250,000 in Dominion stock. Note: Action alerts are not to be confused with Action Cats. Thank you. NOTE TO WONKETTE READERS: THIS EVENT OCCURED MARCH 9. CHECK OUT THE ORGANIC WINE TASTING COMING UP ON MAY 11TH! I'll be up early tomorrow morning helping lead a major Arlingtonians for a Clean Environment cleanup! 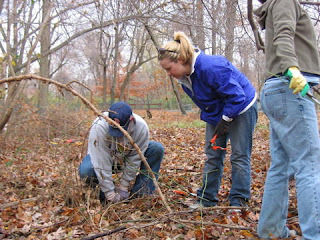 There will be cleanups at three different sites -- Arlington Mill Community Center, Barcroft Park, and Shirlington Park. I'll be at the Barcroft location at 9am trying to look awake and not cold. The forecast for Saturday afternoon actually looks great -- sunny and a high of 60 -- but according to weather.com, it'll be cloudy and 39 at 9am. At early cleanups like this, I usually go with layers, a couple of sweatshirts that I can peel off as it warms up. 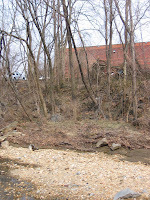 We'll be cleaning up Four Mile Run, and the more people we get, the more trash we'll be able to remove from the stream. I've seen everything from a portable toilet door to a car bumper to an American flag pulled out of the stream, but the most common items are plastic bottles, pieces of styrofoam, and cigarette butts (contrary to popular belief, they're not biodegradable). ACE is partnering on the cleanup with OneBrick, a nonprofit that helps connect young volunteers with local service projects. You can get more details at the ACE website, and if you plan on coming, please let us know! The Green Girlfriend watches The Green Miles lay the smackdown on an invasive multiflora rose bush at Barcroft Park. 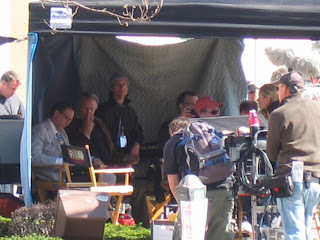 Note The Green Miles' stylish layered sweatshirts. I've joined the blogging team over at What's Up Arlington! From here on, we're known as Team WUA. I'll still be posting just as often to The Green Miles, and in fact you may notice some of my WUA posts look, um, how can I put this ... remarkably similar to my The Green Miles entries. From here on, we'll refer to that as synergy. Check out my WUA posts! I was quoted in yesterday's Washington Post Express on the pending HOT (high occupancy/toll) lanes coming to the Beltway and possible HOT lanes on other Virginia highways. ALTHOUGH CONSTRUCTION hasn't begun on Virginia's proposed high-occupancy toll lanes on I-95/395 between the Pentagon and Stafford County, there's already sticker shock as to how much it'll cost to use the special lanes, being developed by Fluor Virginia Inc. and Transurban (USA) Development Inc. — the first of what could be a regional high-occupancy toll network. heading between Prince William Parkway and the Pentagon during the height of rush-hour congestion, a trip could cost as much as $22.28. The high prices are by design, of course — that way, an influx of solo drivers won't make the HOT section as cramped as the regular roadway. The HOT lanes, which would replace existing HOV lanes on I-95/395, will still be free for buses and cars containing three or more people. So what do you think? For today's Poll Center question, we ask: "Are the proposed tolls for I-95/395 too high?" Go vote (and comment) here and see how your fellow commuters voted station by station, line by line. "I have to pay every time I take Metro, with fares graduated based on how far I ride. Why shouldn't drivers have to pay every time they get on the highway, with tolls graduated based on how far they drive?" Aside from toll roads, driving is the only method of mass transportation that doesn't charge a usage fee. Public buses, trains, and planes all charge fares. Because you don't pay per use (for all the grousing about high gas prices, gas is still a few cents a mile), most of driving involves sunk costs -- buying the car, insurance, things you have to pay for whether you use the car or not -- and at that point, you might as well use the car or else the sunk costs go to waste. So why not charge by use? Several states and the Bush administration are looking at a mileage tax that would basically make every road a toll road, using GPS systems to charge a tax based on miles driven. A tax like that would address emissions issues and could be graduated based on rush hours like the proposed I95/395 tolls. As I've discussed before, we don't have capacity problems, we have usage problems, and I support any effort to promote carpooling or off-peak commuting. Green Living Challenge #2: You're Pre-Approved to Read This Blog! Register with the Direct Marketing Association’s Mail Preference Service to reduce your junk mail. * Each year, 100 million trees are used to produce junk mail. * 250,000 homes could be heated with one day's supply of junk mail. * Americans receive almost 4 million tons of junk mail every year. * The yearly production and disposal of junk mail consumes more energy than 2.8 million cars. There are actually at least two options for fulfilling this aspect of the challenge. The first is the Direct Marketing Association's Mail Preference Service (MPS). For a fee of $1, the MPS will put you on a "do not mail" list that DMA members must follow. The second option is to sign up with a pay service that will selectively scrub you from certain lists while allowing other mail through. For instance, there's an organization called Green Dimes that says it will block your junk mail while allowing through the catalogues you want. Green Dimes will also plant one tree a month while you're a paying member. However, it comes at a relatively steep price -- $36 a year. Me? I just went with MPS, the cheaper option. But if you're a Green Dimes fan, please post a comment to make your case on why it's worthwhile! Been crazy busy at work with ethics complaints against Sen. Domenici and Rep. Wilson. More later. Sen. Pete Domenici is seen here asking David Iglesias and his talking dog why they aren't moving faster with indictments against Democrats. 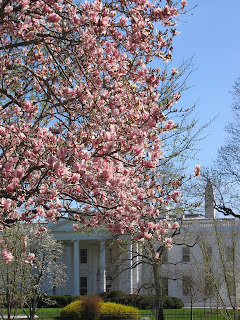 Arlingtonians for a Clean Environment is holding its annual meeting this month! 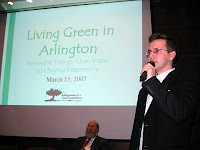 It's called "Living Green in Arlington: Renewable Energy, Clean Water, and Buying Responsibly," and it will take place on Thursday March 15th from 6:30 to 9:30pm at the NRECA Building (4301 Wilson Blvd. 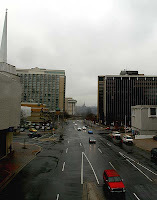 near Ballston Metro). This year we have two big special guests: Arlington County Board Chair Paul Ferguson and NBC4's Wendy Rieger. Paul has made headlines this year for spearheading Arlington's Fresh AIRE program, and Wendy hosts a series of reports called "Going Green" as well as The Green Room blog. After remarks from Paul, Wendy, ACE Executive Director Elenor Hodges, and ACE Board Chair Me, Paul will moderate a panel discussion featuring Scott Sklar (The Stella Group), Don Waye (U.S. EPA) and Monique Tilford (Center for a New American Dream). We'll also have a special offer for people who become ACE members at the meeting and have lots of information about ACE's Green Living Challenge. Oh, and as I always follow the advice of Eric "You'll Get More People If You Say Punch & Pie!" Cartman, we'll also have refreshments thanks to a generous donation from Whole Foods. A recent poll showed 71% of Virginians support a statewide smoking ban, with a full 60% strongly supporting a ban. That's probably a region-wide sentiment, as similar numbers have been found in Maryland, where seven in ten voters want a statewide smoking ban. And for the first time in the nation's history, more than half of Americans live in a city or state with laws mandating workplaces, restaurants or bars be smoke-free, according to Americans for Nonsmokers' Rights. It's usually liberals calling for broad mandates and conservatives urging local control. But in this case, it's Democratic Mayor Bill Euille asking for his community to be able to make its own decision, while Republicans in the General Assembly bitterly refuse to give up power and hang on to the statewide ban on smoking bans. If communities had local control over decisions over smoking bans, I wouldn't be fighting so hard for a statewide ban. "I don't like it. I'd be against it," said Pat Troy, who owns an Old Town pub where smoking is allowed in the bar and on patios. "I want to stand up for people who want a cigarette or a smoke. The rights are being taken from people right and left. After a while, we'll have no rights left." Is it really rights that Mr. Troy is so concerned about? If that's the case, why doesn't he fight for the rights of the 80% of Virginians who are nonsmokers? I guess our right to breathe clean air is less important than smokers' right to smoke whereever and whenever they please. If you think Pat Troy's is taking the wrong stand, please email them! The Washington Times had an article this week with several DC bars claiming a loss of business due to DC's smoking ban. It makes a watertight case that lacks just one thing: Any numbers showing a single DC bar has lost business from January/February 2006 to January/February 2007. Do bars not keep track of sales, or did the reporter just not ask? Usually best to avoid details that could hurt the central thesis of the article. Oh, and it would also help if they had a shred of even anecdotal evidence Virginia has seen any increase in business due to DC's smoking ban. Other than that, great reporting as always from that paragon of journalism, the Washington Times.